Pyotr Demianovich Ouspenskii (known in English as Peter D. Ouspensky, Пётр Демьянович Успенский; was a Russian mathematician and esotericist known for his expositions of the early work of the Greek-Armenian teacher of esoteric doctrine George Gurdjieff, whom he met in Moscow in 1915. He was associated with the ideas and practices originating with Gurdjieff from then on. He shared the (Gurdjieff) "system" for 25 years in England and the United States, having separated from Gurdjieff in 1924 personally, for reasons he explains in the last chapter of his book In Search of the Miraculous. 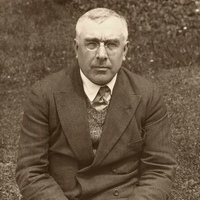 All in all, Ouspensky studied the Gurdjieff system directly under Gurdjieff's own supervision for a period of ten years, from 1915 to 1924. His book In Search Pyotr Demianovich Ouspenskii (known in English as Peter D. Ouspensky, Пётр Демья́нович Успе́нский; was a Russian mathematician and esotericist known for his expositions of the early work of the Greek-Armenian teacher of esoteric doctrine George Gurdjieff, whom he met in Moscow in 1915. He was associated with the ideas and practices originating with Gurdjieff from then on. He shared the (Gurdjieff) "system" for 25 years in England and the United States, having separated from Gurdjieff in 1924 personally, for reasons he explains in the last chapter of his book In Search of the Miraculous.